The Citizens Clean Elections Commission (CCEC) organizes and hosts debates for all elections in which at least one Clean Elections candidate is running. In Legislative District 9, three of the five people running for office are Clean candidates: Jim Love, Victoria Steele and me. 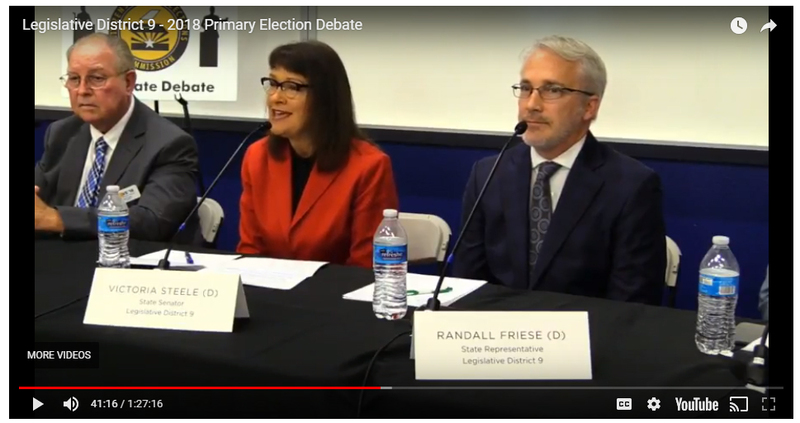 The other two people who are running for house– Rep. Randy Friese and J.P. Martin– are running traditional. 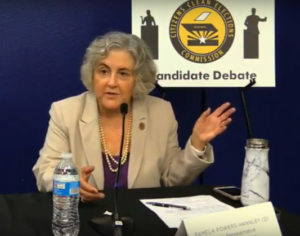 CCEC debates include some questions that are asked of all candidates and other questions that are asked of specific people. I have annotated the debate with time stamps– in case you want to focus on particular topics. Since there were several audience questions about guns in schools, the environment and prison reform, I have grouped those questions and answers. Senate candidates Jim Love and Victoria Steele with House incumbent Rep. Randy Friese. Environment, climate change, water, and air pollution: 45:50, 1:02:57, 1:04:49, 1:08:21 and 1:17:34. For those of you who are following other local races, the LD3 (west side) Clean Elections Debate is here. 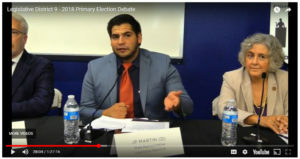 The LD11 (Oro Valley/Marana) debate is here. The LD8 (Oracle and Pinal County) debate is here. The LD10 (Tucson South of Speedway) debate is here. The LD2 Republican debate (Southern Arizona) is here. For the real political junkies, the entire list of debates is here. It’s #TVWorthWatching!